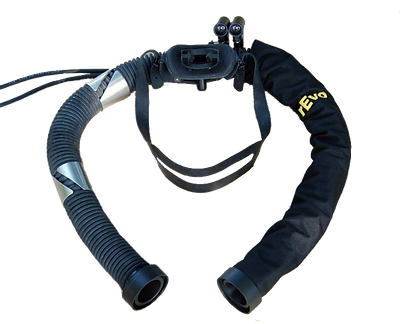 Revo Rebreather - Testlabs Australia PTY. LTD. | Melbourne VPS, Dedicated Server, Cloud Hosting, Storage and Managed Services CloudStack is open source cloud computing software for creating, managing, and deploying infrastructure cloud services. Utilizes an Constant Mass Flow (CMF) Orifice to continuously add pure Oxygen to your breathing gas. The rate of Oxygen the CMF adds should be about equal to what your body metabolizes at rest, this can be adjusted by the diver. During normal diving activity the rate in which our body uses oxygen will go up and you'll need to manually add it in order to maintain your PPO2 level. While this might sound like a lot of additional work, the oxygen addition via the CMF makes it so that you generally wont need to manually add oxygen more than every few minutes or so at depth. This system utilizes the same constant mass flow (CMF) orifice as an MCCR, however, it also adds an automated electronic system of oxygen addition on top of it. 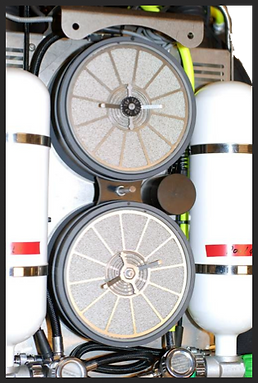 This essentially combines the functions of a Manual and Electronic Closed Circuit Rebreather into one. Hence the name "Hybrid." As an ECCR with a CMF: You may decide to set a PPO2 equal to what you will use the majority of the dive and allow the unit to Electronically maintain it. Combining this with the continuous flow of Oxygen from the CMF will generally result in a lower frequency of Oxygen addition by the electronic solenoid system. Some people enjoy this mode when they know they will have their hands full during the dive (for example a photographer) and would like the rEvo to add oxygen for them. It should be mentioned that this does not mean that you may monitor your PPO2 less than any other system. 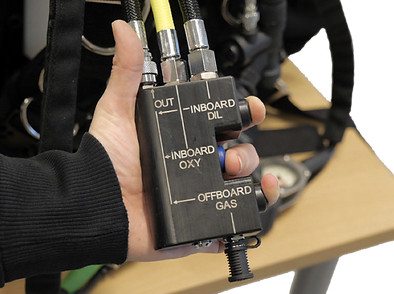 As a Manual Rebreather with an Electronic "Parachute:" You may decide that you like to run your unit manually. A purely manual unit, however, has the unique concern of being just that, manual. If, for some reason, oxygen levels in your breathing gas become too low, the rebreather will not rectify this and it is completely up to the diver to add oxygen. 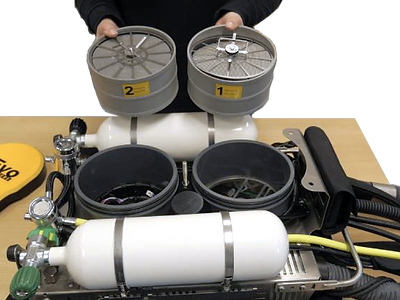 With a Hybrid unit, however, you may set your PPO2 set point to a lower point that is still within the acceptable oxygen levels yet, lower than what you will manually maintain throughout the dive. Essentially using the automated electronic addition of oxygen as a backup "parachute." While there is no electronic only option available for the rEvo, you may at any time decide to use your unit in ECCR mode by simply blocking the CMF orifice using the plug included with your hybrid unit. At this point you may remove the 1ATA cap on your first stage regulator which in turn removes the depth restrictions that are placed on manual and hybrid modes which use a fixed intermediate output pressure on your oxygen side*. *Note: Although the rEvo has been dived much deeper, the unit is officially rated for no greater than 330' for any model according to CE standards. The rEvo comes standard with its own split backplate/harness system. 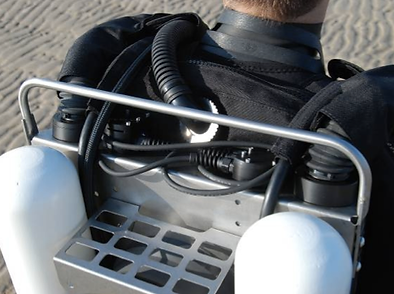 The split design of the harness allows for the divers back to be closer to the mounting surface and counterlungs behind them. 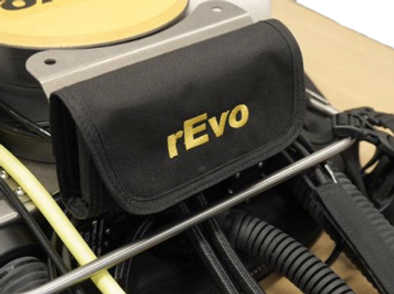 The rEvo 3 Button MAV allows you to manually inject Oxygen or Diluent into your rebreather. 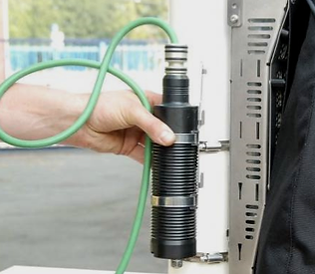 The off-board function also allows you to add gas from a secondary gas source via a Low Pressure Inflator similar to those found on most BC's and Drysuits. Each rEvo features a quick lock slide in tank attachment system. This makes installing and removing tanks a breeze. It can accommodate a wide variety of sized and shaped tanks from carbon fiber to steel. 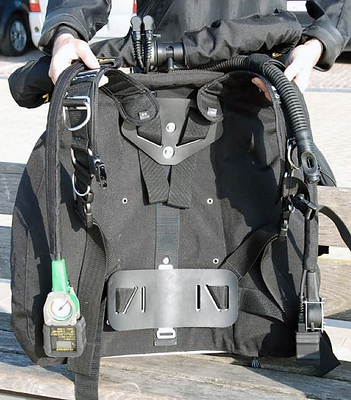 The rEvo QuadroLock Accessory Mounts allow for sturdy attachment of accessories such as a drysuit inflation bottle or canister light to the sides of the counterlung case. 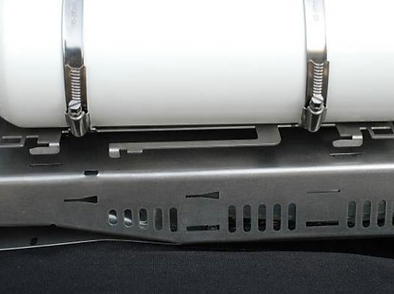 By simply lifting the quick locking tab and sliding the bracket your accessories are easily removed for cleaning, charging, filling or storage. It also serves the secondary purpose of protecting hoses and wiring connections located at the top of the unit. Especially beneficial in overhead environments such as wrecks or caves! © Copyright 2019 Testlabs Australia PTY LTD - All Rights Reserved.